Other agreements signed with the government of that country included: Avoidance of Double Taxation Agreement, Agreement on Trade Promotion and Protection, Judicial Agreements on Extradition, Transfer of Sentenced Persons. PREMIUM TIMES learnt that three of these agreements – the Judicial Agreement on Extradition, Transfer of Sentenced Persons and Mutual Legal Assistance on Criminal and Commercial Matters – are particularly giving those who may have hidden their ill-gotten wealth in the country a lot of worries. According to multiple security sources, as the news of the signing of the agreements broke, some ex-officials started making frantic efforts to either escape from that country or relocate their slush funds out of the reach of the government. The UAE has become a Mecca for Nigeria’s wealthy who are drawn by the expensive high rise properties, glitzy malls and ritzy hotels in the oil-rich country. A security source who has been investigating the pattern of Nigeria’s investment in the country told PREMIUM TIMES that at least $200 billion allegedly stolen from the country’s treasury by former government officials is believed to have been stashed in banks and invested in properties in Dubai and Abu Dhabi, two of UAE’s most prominent cities. With the signing of the agreements the government can now actively demand the repatriation of funds hidden in the country by convicted former officials as well as demand the extradition of other Nigerian fugitives residing in the country. Before now, the UAE was a fortress of some sort for corrupt government officials escaping justice at home. In 2010, one of Nigeria’s most notorious money launderers, James Ibori, the former Governor of Delta State, as the heat over his money laundering cases in court became unbearable, ran to seek refuge in Dubai before he was extradited to the United Kingdom, where he was also wanted for fraud. On April 17, 2012, Mr. Ibori was sentenced to 13 years by the Southwark Crown Court in London. The former chairman of the Pension Reform Task Team, Abdulrasheed Maina, who is wanted for allegedly stealing N2.8 billion is believed to be hiding in Dubai. Several illicit transactions done on his behalf have been traced to the city, investigators said. Earlier in the month, the Economic and Financial Crime Commission (EFCC), put out an order for the arrest of the former Comptroller of the Nigerian Customs Service, Abdullahi Dikko, who is being investigated for fraud. According to the EFCC, Mr Dikko is believed to be hiding in Dubai. 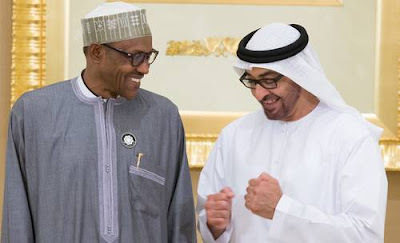 Presidency insiders said Mr. Buhari considers the agreement with the UAE as a “major joker” in his anti-corruption war. “There is abundance intelligence that a substantial chunk of Nigeria’s stolen wealth is the Emirate, with a number of fugitives hiding there,” the source said. “With this agreement, they can now be made to face justice, and their loot recovered. The presidency sees this as a major achievement.